Agriculture confines the cultivation and the breeding process of the plants, animals, food, fuel, medicinal plants, which are used to support human life. The scientific study of agriculture is said as agriculture science which includes the scientific process for the development of various practices such as to attain new crops and animal breeds and is used to understand animal physiology and as well as the crop physiology. It also includes modelling of crop, modelling of animals, plant nutrition, animal welfare, science related to soil as they have very key impact on agriculture. 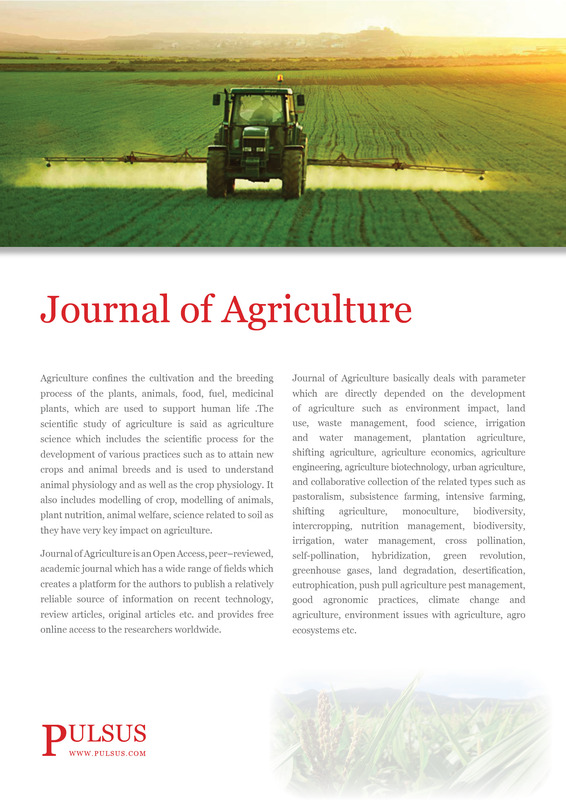 Journal of Agriculture is an Open Access, peer–reviewed, academic journal which has a wide range of fields which creates a platform for the authors to publish a relatively reliable source of information on recent technology, review articles, original articles etc. and provides free online access to the researchers worldwide. Journal of Agriculture basically deals with parameter which are directly depended on the development of agriculture such as environment impact, land use , waste management, food science, irrigation and water management, plantation agriculture , shifting agriculture, agriculture economics, agriculture engineering, agriculture biotechnology, urban agriculture, and collaborative collection of the related types such as pastoralism, subsistence farming, intensive farming, shifting agriculture, monoculture, biodiversity, intercropping, nutrition management, biodiversity, irrigation, water management, cross pollination, self-pollination, hybridization, green revolution , greenhouse gases, land degradation, desertification, eutrophication, push pull agriculture pest management, good agronomic practices, climate change and agriculture, environment issues with agriculture, agro ecosystems etc.